Sunday 14th September, 2008 at 9 a.m.
To help clear the Red Oak’s Wood Copse of undergrowth and debris in the southern corner of the Allotment site with the aim of planting bluebells, wildflowers and/or bulbs in this forgotten area. You only need to walk around the village on re-cycling day to realise what a success this is in Theydon Bois. However Village News has been asked to remind readers of what can and cannot be re-cycled. The following details have been extracted form the Epping Forest District Council website. Include grass, plant and tree cuttings, raw fruit and garden vegetable matter. Don’t include purchased raw vegetables and fruit and those prepared in a kitchen. ProActive – Prostate Cancer Self-Help Group: ProActive is a group of men who share a common problem – prostate cancer. When diagnosed, men may go through a whole series of emotions before coming to terms with the fact of having this disease. In addition to fear, most of us also experience anger, isolation, and avoidance and generally isolated ourselves from accepting the diagnosis. We found it helpful to talk to someone who had similarly been diagnosed and treated and wanted to offer assistance, support and reassurance to other patients and their families. We are not professional counsellors, but we have been through this experience, and are able to listen and respond with some understanding. We can relate our own experience of the treatment we received and how we feel about the disease with hindsight. While we cannot give medical advice, we have all been through the process of diagnosis and treatment, and we are available to talk you through the tough bits. If you wish, we will try to put you in touch with a member who has been in the same situation as you. If you would like to discuss anything, please contact us by email on proactivegroup@ntlworld.com or telephone our helpline on 0774 737 4692. We have members across the PCT area from Bishop’s Stortford to Loughton, and Ongar to Broxbourne including Harlow and Epping. Patients and their partners are welcome to come to our meetings, where they can find ideas and tips on life after prostate cancer, and most of all, meet men (and their partners) who have been through the same problems and who still have an active life after prostate cancer. ProActive currently meets approximately monthly on a Friday afternoon at St Margaret’s Hospital, Epping, but has plans to set up sub-groups, (possibly in Bishop’s Stortford, Epping, Loughton and Harlow), which could meet at times more convenient for those who are working or who have problems getting to the meetings. All our meetings are held either in the Lecture Theatre or the Committee Room which are on the first floor of Birchwood House, St Margaret’s Hospital, Epping from 1.00pm to 3.00pm. Our meetings are very informal – we meet and chat, but when possible, we have a speaker who can talk about an aspect of prostate cancer, including the effects on the individual and his family. We also arrange an information afternoon which we hope will become an annual event – this year, “Life After Prostate Cancer 2” will be held on Friday 10 October 1.00pm- 3.00pm at St Margaret’s Hospital, Epping, with speakers on the latest research, post-operative experience and other prostate-related topics. Places are limited, please phone 0774 737 4692 or e-mail proactivegroup@ntlworld.com to book a seat (partners are also welcome). We are asking for a donation of £2.00 per head to help defray the expenses of the event. Theydon Bois & District Rural Preservation Society Fears Parking Proposals will Destroy our Green Belt: We are sure you have heard about the leaflets put on the cars at the station and in the village recently. The original leaflet informed people of the meeting to show the plans at the Village Hall on Wednesday 27th August between 5.30 and 7.30pm. (it is actually for 309 spaces not 250 as originally stated).The initial reaction of Theydon Bois & District Rural Preservation Society is that they hope Green Belt planning policy will prevent this. The Society is unsure how much consultation, if any has taken place with EFDC and their initial reaction to the plans. As far as we are aware the plans on show at the Village Hall have not been submitted formally to EFDC but this may have happened in the last few days. "Following the Society's and others representations about recent developments on the former Trek site, the construction of a motocross circuit on the Blunts Farm site , unauthorised buildings at Old Foresters and most recently this public viewing of a possible proposal for car parking, we are concerned such developments would tend to undermine the Green Belt status of this site. For many years the Society has worked to maintain the line of the railway as the boundary between village and countryside and trusts that the District Council, advised by the Planning Department, will continue to support this view." "London Underground (LU) and Transport for London (TfL) are working to develop a long term strategy on car parks across the network. TfL is conducting a car park usage survey which is expected to be complete in Autumn this year. Progress on proposals across the Tube network will follow completion of this review and agreement of the strategy. LU has had preliminary discussions with Epping Forest District Council about car parking at Theydon Bois. We will brief officers at the Council on the outcome of the review. Any proposals for Theydon Bois would have to take into account the impact on local road congestion and would require funding - and a business case for funding. The flyer proposing a new car park in Theydon Bois has been not produced by TfL, this is not a TfL initiative and the proposed site is not TfL land." Paving over your Garden? : This is a guide to proposed changes to the planning system which have not yet taken effect. More and more householders are laying hard surfaces over front gardens to provide off-road parking. At present there are no restrictions on a householder's ability to do so. Hard surfaces lead to accelerated run-off of surface water which can overload sewerage systems in more urban areas. This problem is likely to intensify as climate change produces more torrential downpours. The Government intends, therefore, to require that paving installed using permitted development rights does not make this problem worse. In future paving in front gardens will not be permitted development rights unless the surface allows the water to drain away naturally. This can be achieved in a number of ways - most simply by ensuring that water runs off to an unpaved area such as a garden border. Additional guidance on how to do this will be available on the Planning Portal before the changes come into force. Please bear in mind that at present this is a guide to proposed changes to the planning system which have not yet taken effect. The Woodland Trust Art Work for Theydon Wood: Members of the Parish Council were invited to see a preview of the plans that The Woodland Trust are intending to submit to Epping Forest District Council. The Trust is proposing to submit a planning application for an artistic representation of a seed case – a raised earthwork – to stretch down the hillside. The artwork will be visible from the motorway and will be planted with trees and bushes. It will be formed from material sourced from the site from the excavation of a pond. A small amount of other material will also be brought in from elsewhere. The pond will be fed by the brook which runs through the site, forming a watery habitat for more species of wildlife. It is intended to make a point of interest for local people to visit until the newly-planted trees become more established. Theydon Bois Wood is part of the pioneering multi-agency Green Arc project, which covers 400 square miles of countryside to the north and east of London, stretching across Essex and Hertfordshire. Plans for the area have recreation and wildlife conservation objectives, incorporating flood risk management, reduced levels of pollution and provision of locally-produced food, together with health and economic benefits. One of its aims is to provide improved public access to green spaces. Back in 2006, the Woodland Trust bought 98 acres of formerly arable land on Abridge Road in Theydon Bois. The site sits within the boundaries of ancient Epping Forest and the Woodland Trust aims to plant it with 50,000 native trees. The planting programme is well underway, thousands of saplings are already in the ground, and a second planting season is due to start in the autumn. Young saplings of oak, ash, field maple, hazel, hornbeam, crab apple and other native tree species already dot part of the hillside and are just about visible from the northbound carriageway of the M11. “The earthwork has been designed to make a statement to raise awareness of the Green Arc project in Essex and Hertfordshire, and climate change issues,” said Woodland Trust campaign development officer Christina Joachim. The new woodland and its artwork will be cared for and managed by the Woodland Trust. The Parish Council are now awaiting notification of the submission of the final plans from EFDC. Once we have the plans they will of course be available for residents to view at the Parish Office in the Village Hall. Any resident wanting to comment on the plans should write to EFDC, precise contact details will be available with the plans at the Parish Office. Please copy your comments to the Parish Office so we can take all opinions into account when the application is discussed at the meeting of the Parish Council Planning Committee the date of which will be advertised on the Parish Council notice boards. This is a public meeting and again we would welcome any resident who would like to attend and express their views. Alpine Society now meet in Village Hall: From September the Epping Forest Group of the Alpine Garden Society will be meeting in the Village Hall, Theydon Bois. The Society is for all those interested in alpine plants, whether in the wild or growing at home. The Group meets monthly from September to May, usually on the second Tuesday of the month and meetings take the form of an illustrated talk or demonstration, followed by refreshments. There is also a plant raffle, sales table and an alpine plant competition. The annual subscription is £5 and members receive a monthly newsletter by email or post. The charge per meeting is £2 and non-members are welcome. 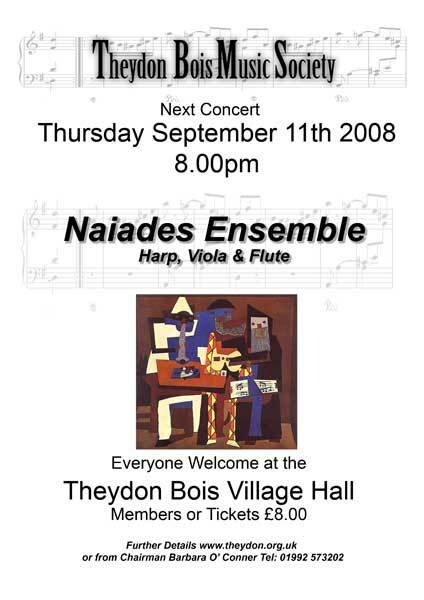 Sept. 11th Naides Ensemble - Harp, Viola & Flute. Oct. 9th Rossignols Amereux - Soprano, Flute & Piano. Nov. 13th Miriam Kramer & David Silkoff - American Violinist & Piano. Dec. 11th "Friends" - Francis & Paul Chilvers & others. Membership is now £45 for the whole season or tickets are usually available on the door at £8.00. Full details of the society and the rest of the seasons programme are here. We are pleased to confirm that following negotiations between Theydon Bois Parish Council and Epping Forest District Council it has been agreed that the village parking restrictions will not be enforced on the next Bank Holiday, Monday 25th August 2008 or future Bank Holidays. We are encouraged that we have been able to secure the agreement of Epping Forest District Council to this trial arrangement for the forthcoming Bank Holiday and would welcome any feedback from residents so that we can inform Epping Forest District Council accordingly. We would like Theydon Bois to be a plastic bag free-zone. 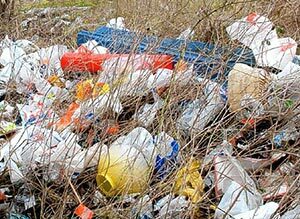 We are worried that plastic bags are damaging the environment and killing animals. We think that if shops would charge 50p per plastic bag, people would not want to buy new bags and re-use what they have. We are disgusted of what people are doing to our world and wildlife. Most people aren’t listening to what people say about recycling, which we are all angry about aswell. Did you know that typically bags are used for only 20 minutes before being thrown out? But they will take up to 1000 years to rot away! If the Normans had used plastic bags in the 1066 invasion, archaeologists would be digging them up today. We would like packaging in shops to be changed so people do not use plastic bags and throw them away. We really want Theydon Bois to be a plastic bag free-zone. People of Theydon Bois can you help us? Kelsey Hall, Hannah Orna-Harris, Massimo Previ and Sophie Rowson – Theydon Bois Primary School. 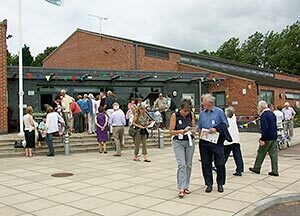 Keen, enthusiastic volunteers are needed to take over the running and organisation of this much needed and well-used facility for the elderly residents of our village. The Day Club runs on Wednesdays from 10.30 am until 2.30 pm and is held at Robert Daniels Court. A dedicated team of helpers and drivers enables elderly and house-bound villagers to spend a happy day socialising with others, playing quizzes and games and refreshments are provided. The Day Club is such an important part of village life for many elderly folk who would otherwise spend time alone and provides companionship and entertainment on a weekly basis. Marian Mellis, the present co-ordinator, has announced her intention to step aside from her role after many years helping with and running the Day Club and a replacement is needed otherwise the Day Club will be forced to close. On behalf of the village we would like to extend our thanks to Marian for all her considerable work. It would be very sad indeed if the Day Club has to close due to lack of volunteers. If you feel that you can help take on the running and organisation of the Day Club then please contact Marian Mellis on 01992 813793. Marian is only too happy to answer any questions and to help with hand-over arrangements. Primary School Wins International News Day Challenge: Pupils at Theydon Bois Primary School beat more than 700 other schools in the the International News Day Challenge to produce their own school newspaper, news web site or podcast. They won the Key stage 1 Newspaper category after running their own newsroom at the school for a day. Their stories covered local events as well as national and international issues. The Guardian newspaper sponsored the event and judged the results along with a number of former teachers. They commented that "the standard of this years competition was particularly high and that current newspaper editors should be watching their backs given the creativity and attention to details shown by the entrants. Theydon Bois Primary School did a fantastic job and well deserved their award". Pupils from the school were invited to the Guardian offices to receive their awards and perhaps to give the journalists there a few tips! John Powell is Teaching Awards 2008 Winner: The Ted Wragg Award for Lifetime Achievement, sponsored by The Innovation Unit in East of England has been won by John Powell of Davenant Foundation School. The achievements of this long-standing and outstanding music teacher are breathtaking. John Powell has taught at this large comprehensive for 37 years and inspired thousands of children. Two thirds of pupils are actively involved in music making, including many who showed no interest in music at primary school. Half of all pupils are learning an instrument, and 15 peripatetic music teachers visit the school to teach them. John has organised numerous major musical events, such as music tours to Spain and Italy, and performances in the Westminster Halls and St Paul’s Cathedral. And, as Head of Performing Arts, has mounted many school shows and musicals. Another, now a professional musician playing with a London orchestra, remembers how John helped prepare him for Cambridge and how John’s influence still informs how he approaches music today. But John is also totally dedicated to making mainstream music lessons lively and interesting, and all pupils appreciate his patience and good humour. He contributes greatly to our wider community, by nurturing new music teachers, and supporting other schools in his region, as well as putting on community concerts and other events. Colleagues say he is, quite simply, inspirational. The Teaching Awards judges say this is a man who deserves “the highest award possible. Article and photo courtesy of The Teaching Awards Web Site. 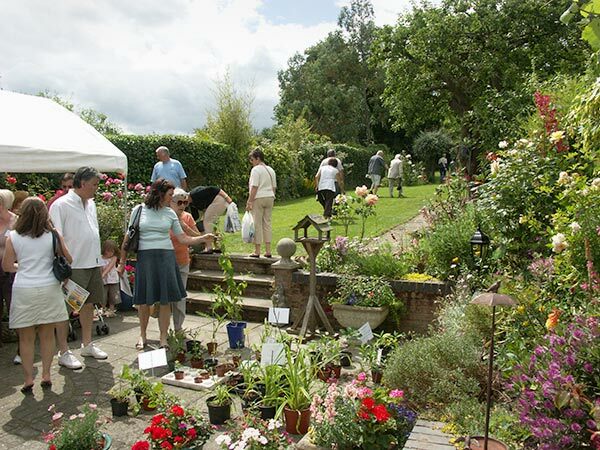 Open Gardens Day 2008 raises £5,700: The sunny weather encouraged around 1200 people to visit the gardens on Sunday 29th June – and one gardener reported 1100 of them had visited her garden, fortunately not all at once. People who have lived in the village for years remarked that they had never seen so many cars on the Green (this was before the Donkey Derby which saw a similar number of cars). It was a great day and our sincere thanks go to all those involved. Special thanks to the gardeners of course who work so hard to make their gardens special and thanks too to all those helpers without whom we could just not run the day. Profit for the day was over £5,700. We trust we can again arrange a very pleasant day in 2009 for visitors. Carol & Graham James & Linda Cohen-Klein. Brilliant sunshine, lack of water...(.don’t knock the weather though!) makes it difficult to dig and garden but that didn’t matter....we had many new exhibitors who tried something new. Even people who have lived in the village all their lives as well as new comers managed to find flowers, vegetables and produce, which they proudly staged. We had fewer flowers this year but the standard of plants was high, which showed the care and pride people are taking in their gardens now. New allotment holders were encouraged by their success to try more classes next year...lets hope they do! Children's work was stunning with an exceptional class for pottery. Plants grown by the children hopefully will encourage a love of gardening and ‘growing your own’ to eat. Many visitors enjoyed the afternoon of this traditional village event............however.....next year will be our 100 show and after that, who knows? A loyal band of volunteers, as well as committee members, worked hard to man the plant stall, tea room (which was busy all afternoon,) raffle......all of which showed an increase over previous years. Epping alpine society raised a lot of interest as did the local Village Design Society. A tombola in aid of Macmillan Nurses raised £70 Events like this take a lot of hard work but give the community a feel good factor MANY THANKS to the army of helpers who made the show a success. Theydon Bois Parish Council Open Surgeries: Parish Council announce new Open Surgery Sessions for Villagers. These sessions will start on the 4th August and last for approximately 1-1/2 hours each. It will enable villagers to discuss in confidence issues of concern. The Surgeries will take place on a monthly basis (1st Monday of the month) and dates for future Surgeries can be found on the Council Meetings Page. Having listened to our residents, and to improve the power of communication, we are pleased to announce that we will be running a pilot scheme of Surgeries once a month. safe and pleasant place to live. Bald Headed Trip to Namibia: Villagers Geogina Hayes and her husband Nigel are off to Namibia in Africa for two years of charity work with VSO starting on the 5th of September. She is hoping to raise a £1,000 in sponsorship towards the work of VSO as it costs them £15,000 to recruit, train & send a volunteer to his or her placement. 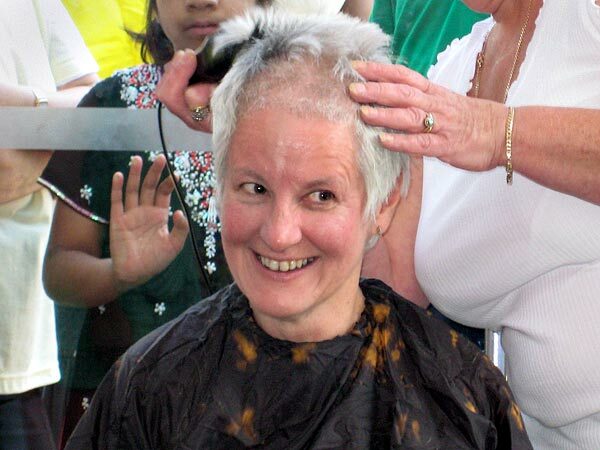 To help raise this she took the drastic step of a sponsored head shave on Monday 21st July. At least the new hair cut should help her to stay cool for the trip! Theydon Bois & District Rural Preservation Society report the death of Ralph Weston: It is with great regret that we report the death, in hospital, of our President Ralph E Weston, aged 92. Ralph joined the Committee of the Society in 1980, soon after retiring from his post as Government Chemist - a job that took him to both sides of the Iron Curtain and for which he was awarded the OBE. In 1983 he was leading walks for the Society and from at least 1990 until 2003 he monitored the weekly Planning Lists with great diligence and attention to detail. From 2004 he was our President and his knowledge and wise advice will be greatly missed. Among his many interests Ralph was a keen cine and still photographer and long-time member of the Epping Film Society and on occasion opened his garden to the public on Open Gardens Day. He is survived by his wife Vera, their two children, grandchildren and great grandchildren. 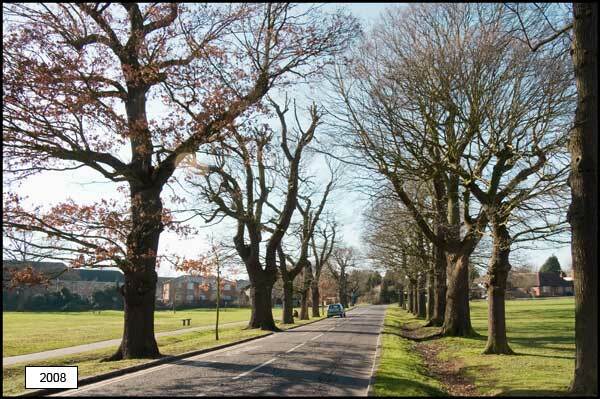 Following on from a site visit to the avenue of trees along Loughton Lane by the Epping Forest and Commons Committee in March 2007 the Superintendent of Epping Forest was asked to prepare options and consult with the residents of Theydon Bois about the future of the Oak avenue. Eight options were prepared and presented by the Superintendent at a public Parish Council meeting on 31st January. Two further options were suggested at that meeting and were then offered for consideration. On 18th February further consultation was conducted and interested parties were given the opportunity to vote on one of ten options. Option 1 was to remove are replace all existing Oaks in a single exercise. Option 2 was to Plant a new line of Oaks outside existing line to create a wider avenue and remove existing trees over time as required. Option 3 was to create a new avenue away from the road on either north or south side. Option 4 was a sequential "wave" felling and replacement programme. Option 5 was to plant an additional avenue of trees perpendicular to the existing avenue. Option 6 was to plant additional avenues along The Green southern edge and removal of existing Oaks as required. Option 7 was to retain existing avenue and manage as required create new group planting around Theydon Bois Green. Option 8 was to remove the north avenue of trees and re-route path with new south side row of trees. Option A was to allow the Avenue to diminish and left as a green open space, and the road between the avenue closed to all vehicular traffic. Option B was that as existing trees die replace with new trees, and the road between the avenue closed to vehicular traffic. The proposal to plant 60 oak trees as per option 2, the clear favourite, was agreed on 7th July at a meeting of the Epping Forest and Commons committee at the Guild Hall. It is intended that planting will commence during the winter of 2009-2010. It is proposed that large trees will be planted that would be supported by a root anchor system. This will help secure the trees, reduce vandalism and look more in keeping with the landscape of the Green. Some trees will be felled over the next five years but it is hoped that the healthier larger specimens would remain for the next 20 years. The cost of £15,600, which includes two years of after care watering, would be met from the Epping Forest local budget. It was noted however by Jacq Dodman and Anthony Purkiss, who attended the Guild Hall Meeting (but as is normal practice were not allowed to speak) that a number of Verderers said that the Parish Council should be approached to help fund the project. The Parish Council will remain in communication with the City of London and the new superintendent Mr Paul Thompson, who commences his post on 1st September, to ensure that this iconic feature of our village is maintained and preserved for future generations. Unfortunately we did not win as last year, but we were still runner up in our class. * Class 1 Population over 5,000 less than 10,000. * Class II Population 2,000 to 5,000. * Class V Population under 300. Theydon Bois Ladies help raise £90,000 for Hospice! : "After registration and our initial warm up we were ready to embark on our 10k! 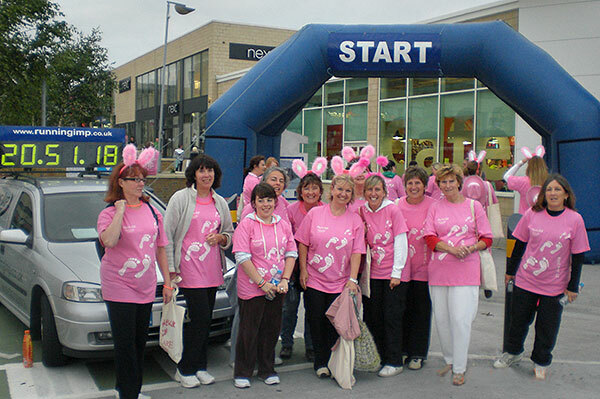 The Theydon Bois contingent set off at 10.30 pm on the evening of Saturday 21st June with 1300 other ladies, all wearing our bright pink St Clare Hospice teeshirts emblazoned with 'Midnight Walk 2008'. Our outfits were complemented with fluorescent bunny ears that lit up in the dark - quite a dramatic sight at midnight as we all followed our guides around the cycles paths and streets of Harlow and Old Harlow. This was much to the delight (and surprise) of onlookers, people in restaurants and pubs and other night-revellers - all of whom came out and clapped and cheered as though we were celebrities! It was an emotional time as people relayed their stories to the local radio station as to why they were walking and in whose memory. Of course some were just walking to support a wonderful Hospice serving the people and their families of West Essex and East Herts." So well done to all who walked (spot at least three Parish Councillors in the picture), and thank you to everyone who sponsored them. £90,000 is a fantastic amount of money raised for a great charity. And they hope to do even better next year! ITV want to hear from the ladies of rural Britain for a makeover programme with a twist! : Are you an active member of your village community? Perhaps you are a bell ringer, farmer or a farmer’s wife, supporter of women’s societies, a parish councillor, the village eccentric, the proprietor of the village tea rooms or even the producer of the local prize-winning preserves? Does your role in village society define or restrict the way you dress? Perhaps you take pride in your appearance but stick to your comfort zone for fear of getting it wrong? Whether you prefer pearls and cashmere or tweed and wellies, we want to hear from you. And for those who wouldn’t naturally put themselves forward, but are intrigued to hear more, please do get in touch. Stop Stansted Expansion Campaign: There will be a presentation prior to the next Parish Council Meeting on 31st July. The National Air Traffic Services Consultation with proposals for changing airspace arrangements which has been extended from 19th June to 22nd June. The link is www.stopstanstedexpansion.com/nats. Calling All Dog Owners: The majority of dog owners are responsible and pick up their dog’s mess in bags and dispose of the bags in the dog bins provided around the Village or take them home. Unfortunately a small number of owners put the mess in a bag and then leave the bag where it is without disposing of it. Please help keep the Village a clean and pleasant place to live by disposing of dog waste appropriately. 99th Horticultural Show Saturday 26th July 2008: The months are speeding by and the weather is, as usual, causing gardeners many headaches! Do you plant out? Or will it frost tonight? Which slugs and caterpillars attacked my plants today? Or sneaked up and munched the young shoots?? We all face the same problems and challenges in the garden but this year, could you find a bloom or plant to enter in the village show? 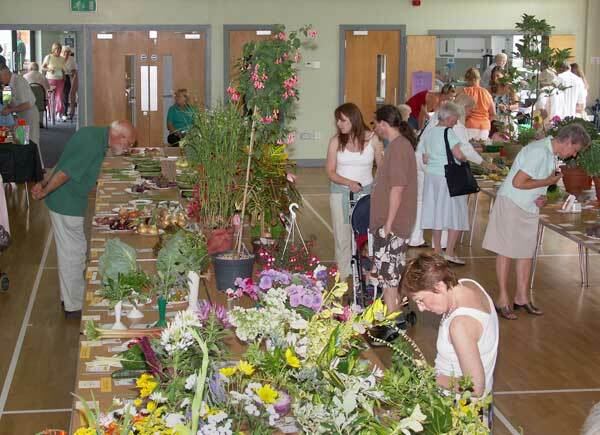 Village shows are an important part of our heritage and Theydon Horticultural Society have held them since 1899. Very few societies have been estabished and active in village communities as long as we have, providing a service for our members through the trading hut, talks, outings and the annual show. There are various classes for handicraft, cookery, childrens section as well as seven photographic categories, and the main fruit, vegetable, plant and flower sections. If you haven’t entered a show before, and are not sure how to stage your flowers or veg., help is available from the show secretary or any committee member. Please look in your blue show schedule for contact numbers. If you haven’t received your copy of the schedule and are interested in becoming a member of the society, please contact Jane Turner 812652 or Tricia Haslehurst 812177. British Legion Appeal: I have for many years been involved in the Royal British Legion Poppy Appeal and our Service of Remembrance at St Mary’s Church. This edition of Theydon Bois Newsletter gives me the opportunity to say “thank you” for your generosity and support. I want to introduce you to the Royal British Legion Friends of Somerset Legion House our “Poppy Appeal Centre” in Weston Super Mare, a recently built home for service and ex-service personnel who need a period of rest. The centre has 47 twin rooms and a staff of 45. It is a charity and anyone can become a “Friend”. The annual membership fee is only £5. It is a very worthy cause and if you would like to join please send your cheque payable to Friends of Somerset Legion House, 57 Beach Road, Weston Super Mare BS23 4AL or let me have them at 45 Baldocks Road Theydon Bois and I will forward them on. Please print your name and address on the reverse side. Following the successful completion of the 50 Favourite Trees project, the focus has now turned to recording all the district’s veteran trees. In November 2007 we were awarded a grant from the GreenArc specificallyfor the Veteran Tree Hunt. This enabled us to undertake a whole range of extra projects including full-time surveying, schools outreach work and a book. Six parishes were chosen for systematic surveying, of which Theydon Bois was one. With the help of volunteer tree wardens and two part-time surveyors, we have recorded 1044 veteran trees with another 282 regarded as notable. For the district as a whole the number is over 2000. An ancient landscape is emerging, with more veteran trees than we expected being found. But the largest tree found (so far outside of Epping Forest) is in the Deer Sanctuary at Theydon Bois. This oak measures 6.6m in girth, has a height of 20m, and is over 450 years old. The 1880 map shows this tree as part of a line of trees, some of which still exist. It has lost a major limb and its huge knuckle has created a flat surface over a metre square from which a silver birch tree is now growing. Access is restricted but it can be seen from the public footpath that runs adjacent to the sanctuary. Alternatively you can go on a virtual tour of this tree by clicking the video link on the website. 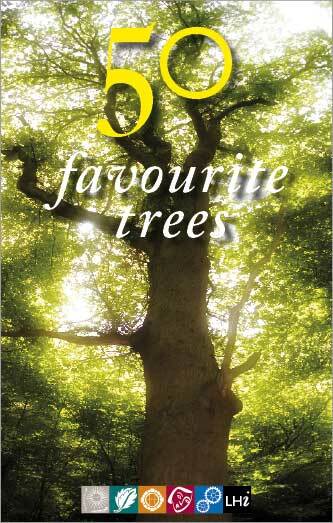 Finally, look out for a book of the whole project which will soon be available highlighting the 50 favourite trees and our hunt for the all our veteran trees. Countrycare Office (01992) 788 203.